Washington, D.C., USA–CareerACCESS has found a federal agency that wants to be its lead agency. Bob Williams, the Deputy Commissioner of the Health and Human Services Administration for Community Living, stated at four different events that his agency will do all they can to help pilot CareerACCESS. At an event with people from CareerACCESS, Bob had ten of his staff learn why CareerACCESS was important. As the keynote speaker at the closing plenary, Bob stated his commitment to CareerACCESS, and at a NCIL board meeting he said that Annette Shea will be our liaison. Right after the board meeting, Bob met with some of us to strategize steps. Jennifer Sheehy, acting Assistant Secretary of the Office of Disability Employment Policy, also expressed real interest in seeing that CareerACCESS gets piloted. She appointed Andy Arias as the liaison to CareerACCESS. 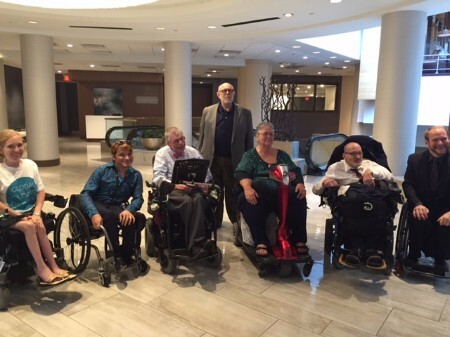 We had a meeting with members from the CareerACCESS National Advisory Committee including Bob Zdenek, Jack Mills, and Michael Morris to brainstorm how we might begin piloting without engaging SSI. Much more discussion is required. We met with David Hoppe, Chief of Staff for Paul Ryan, and Ted McCann, legislative analyst. They were happy to hear that Senator Leahy from Vermont included provisions in the Senate Appropriations Bill that would allow a CareerACCESS type of program to be studied. They were very clear that no Appropriations Bill would be approved until next year. They wanted to know that we had consensus from the Developmental Disability Community. Although they made no commitments, they invited us to keep in contact. Photo (from left to right): Frances Isbell, Andy Arias, Bob Williams, Eric Glunt, Barbara Butz, Neil Jacobson, and Daniel Mellenthin. More than 100 people attended the CareerACCESS workshop at the National Council on Independent Living’s Annual Conference. Enthusiasm was very high. Andy Arias and Daniel Melthimin did an excellent job leading the workshop. Mary Margaret Moore from Massachusetts and Kathy Hoell from Nebraska did a wonderful job talking about their states’ desire to pilot CareerACCESS. The CareerACCESS workshop followed a dinner the night before that was attended by over 20 young adults with disabilities from all over the country that spoke enthusiastically about working with us to get CareerACCESS implemented. We spoke with Gene Sterling from the Urban Institute who discussed the need for CareerACCESS in order to create a workers pipeline to fill the workers shortage that they expect will happen in the very near future. We also spoke with Mike Murphy and Corbin Evans from the Center for Responsible Federal Budget. They may be interested in working with us on developing a Return on Investment for CareerACCESS. We had a good meeting with Yoni Ben Shalom from Mathematica. He recommended we look into the LADDER Act and see where CareerACCESS might intersect with it. We met with two young adults with disabilities interested in the CareerACCESS Project Manager position. We met with the PolicyWorks Board. One of the Board members noted that CareerACCESS was a revolutionary idea whose time has come. All in all, it was a very productive week. CareerACCESS is clearly on the national radar. We are coming home with a slew of follow-up items. Now is the time to forge ahead and Go! Go! Go! Thank you! We are very excited about it!